Rosa Mexicano has closed at Atlantic Station. The New York-based Mexican restaurant reportedly closed for Christmas, only to reopen Tuesday afternoon to tell employees that they were now jobless. ToNeTo Atlanta was informed in 2015 that Rosa Mexicano's Atlantic Station location was closing "soon" but after additional research and with both Rosa Mexicano and Atlantic Station management denying the rumor, we concluded it to be just that: a rumor. Rosa Mexicano's 200-seat Atlantic Station location opened in February 2006, around the same time as the project itself debuted. As of midnight Wednesday, the Atlantic Station location was still listed on the Rosa Mexicano corporate website. Rosa was one of the last few remaining original tenants at Atlantic Station. Moe's Southwest Grill and Copeland's Cheesecake Bistro both closed this past January. Moe's has already been replaced with Salata, a new to market quick serve salad joint. Copeland's is due to be replaced with Gyu-Kaku, a Japanese barbecue restaurant, which after a number of delays is expected to open this coming March. Most recently, Lobby Bar & Bistro in the TWELVE hotel & residences at Atlantic Station was rebranded as Allora. California Pizza Kitchen (CPK), Boneheads and Kilwin's are the last three remaining eateries from the development's original roster. ToNeTo Atlanta has reached out to Atlantic Station's management regarding potential plans for the now vacant 6,800 square foot restaurant space and will update this post when we receive a response. If you are in need of FOH or BOH help for your new or existing restaurant, ToNeTo Atlanta encourages you to do what you can to offer jobs to those displaced by this sudden restaurant closure. Please comment with below with any opportunities or use hashtag #Rosa2Work on Twitter. 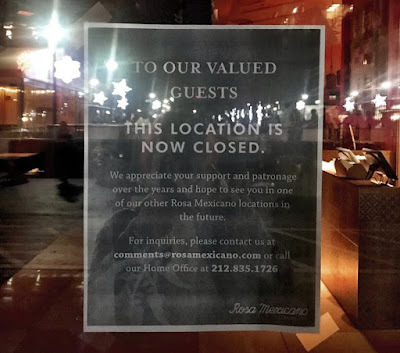 Are you surprised by Rosa Mexicano's abrupt closure at Atlantic Station? What would you like to see open in place of Rosa Mexicano at Atlantic Station? Do you think Atlantic Station has markedly improved over the past few years? Can anyone explain under what circumstances would a restaurant close out of the blue like this? Look at the demographics of atlantic station .... Dont ignore the implications. Good luck new tenants! Napoleon's and The Vista Roon are hiring all positions. We would love to speak with anyone leaving Rosa's. Please come to our restaurant and fill out an application and speak with a manager. I'll go out on a limb and guess that their expenses were greater than their revenue. And if you mean, why suddenly shutter without warning? If you give your employees say a month or even a 2 month notice, most will suddenly quit before the final day, leaving the restaurant chronically short-handed for its final weeks. Advanced notice can also lead to theft of food, alcohol, giving away freebies without permission...etc. The Daiquiri Factory (889 W. Peachtree St., Atlanta, Ga. 30309) and Cirque Daiquiri Bar and Grill (2160 Monroe Dr., Atlanta, Ga. 30324) are both hiring for all positions. Please apply in person at either location, Monday through Friday, from 12-5pm. We welcome anyone who’s looking to come on board! If you’d like to speak with someone, please feel free to contact us at: 404-996-2482 or on instagram @cirqueatlanta or @thedaiquirifactory. We’re so sorry to hear about the closing of Rosa. The Daiquiri Factory (889 W. Peachtree St., Atlanta, Ga. 30309) and Cirque Daiquiri Bar and Grill (2160 Monroe Dr., Atlanta, Ga., 30324, are hiring for all positions. We welcome all former employees to apply in person at either location and we would be happy to have you in our ever growing businesses. If you’d like to speak with someone, contact us at: 404-996-2482 or on instagram @cirqueatlanta or @thedaiquirifactory. Sorry, but not too surprised, to see them close. I’ve eaten there a number of times, but had a hard time paying the premium for the ambiance. There are too many good cheap Mexican restaurants in Atlanta, many with better food than Rosa Mexicana. I wasn't looking for a surface level sarcastic answer like the one the another Anonymous poster provided. Obviously they couldn't afford to stay in business. However, sudden closures seem to be more prevalent in the restaurant industry. I understand that they don't benefit from giving customers prior notice to liquidate merchandise. Maybe banks are less forgiving on restaurants and order them to shut down immediately once they miss a payment? Maybe it's the property manager that forces the restaurant to shut down immediately, etc. Yes restaurants do this all the time. It's awful. There's a better way to handle this. People are spending more than ever on eating out — there are just more options to choose from. "There's a better way to handle this."